Find out the new format for the Small World Races and Special Powers expansions: Small World Power Pack #1 and Small World Power Pack #2. These two expansions are now available in stores at a suggested retail price of €25, they will replace the older ones in order to be in accordance with the latest expansions of Small World such as River World and Sky Islands. 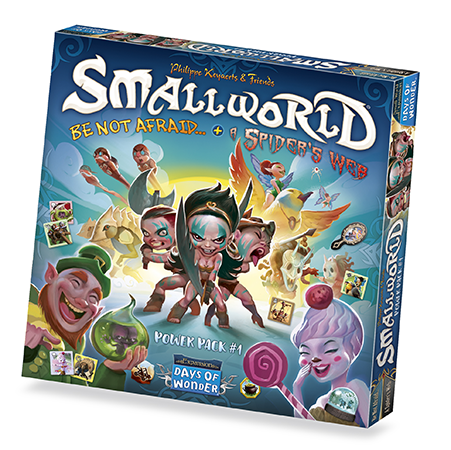 Small World Power Pack #1 combines all races and special powers from the previous expansions: Be not Afraid… and A Spider’s Web and comes along with a tray to store all the tokens. 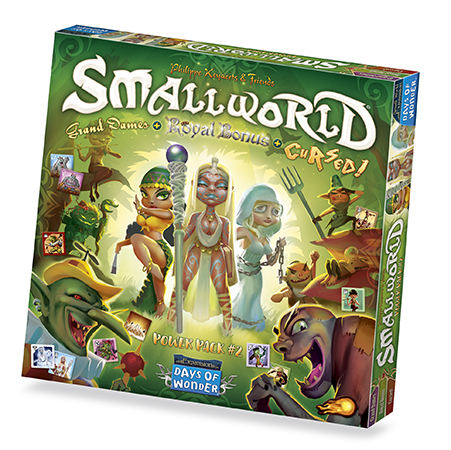 Small World Power Pack #2 combines all races and special powers from the previous expansions: Cursed!, Grand Dames of Small World and Royal Bonus and comes along with a tray to store all the tokens. Both Power Pack come with a storage tray that made exactly one third of the box so if you got Small World Power Pack #1, Small World Power Pack #2 and Small World Sky Islands you can store everything in one box. Crafty? Small World Power Pack #1 is an expansion and requires a copy of the original Small World board game. It includes 8 Race banners: Barbarians, Homunculi, Pixies, I Witches, Leprechauns, Pygmies, Skags & Slingmen; 8 Special Power badges: Barricade, Catapult, Copycat, Corrupt, Imperial, Lava, Mercenary & Soul-Touch for a total of 42 various tokens and 98 Race Tokens. This expansion also contains rules and a tray to store everything from this Power Pack. Small World Power Pack #2 is an expansion and requires a copy of the original Small World board game. It includes 8 Race banners: Fauns, Goblins, Gypsies, Igors, Kobolds, Priestesses, Shrubmen & White Ladies; 10 Special Power badges: Aquatic, Behemoth, Cursed, Fireball, Historian, Hordes of, Marauding, Peace Loving, Ransacking, Were- for a total of 42 various tokens and 98 Race tokens. This expansion also contains rules and a tray to store everything from this Power Pack. It was a lovely spring morning; Giants were getting new tattoos and the rest of the Small World inhabitants were preparing for another day of conquest. An eerie silence settled on the lands as a huge shadow glided over forest and mountain. Had the Wizards accidentally given their flocks of sheep flight again ? Find out Small World – Sky Islands a new expansion for the award-winning fantasy board game Small World, designed by Philippe Keyaerts and T. Alex Davis. Set sails for a new Small World adventure with River World! Armed to the teeth, a ferocious bunch of pirates is descending the river, directly threatening your harbors. How will your Merchant Dwarves fare against the sea rats? Maybe you should have left before, as the Elves did… they told you that they had foreseen great trouble in the Temple of the Seer, but as usual, you didn’t listen. After the pirates, who knows what could happen? For Easter, we offer Ticket to Ride for $2.99 instead of $6.99! The mobile version of the famous board game is on sale on Google Play, Apple app store and Amazon. Now is your chance to discover a timeless classic of the board-game universe. Don’t miss Small World 2 Halloween Sales on Steam – Get up to 60% off now ! If you’re not yet a Small World 2 player, or if you have a friend you’ve been meaning to invite to join in the Small World fun, now is the time to do so: For a very limited time, Small World 2 for Steam, which runs on your PC, Mac and Linux is available for 60% off the regular price! Even better, all the Small World expansions for Steam – Cursed!, Grand Dames and Be Not Afraid… – are also half price, making it the perfect time for existing Small World 2 users to add these new Races and Special Powers. The Small World Designer Edition is available for everybody: order your copy on June 9! R’hka and his dwarf companions were digging for gold, but nothing could prepare them to the discovery they were about to make. With shovels and pickaxes, they were progressing in the mine. Suddenly, one of the pickaxes hit what looked like an old crate engraved with strange runes. Opening it, they discovered finely-sculpted figures, painted wooden tokens and tons of glittering metal coins… sure, it was not gold, but a nice treasure chest nonetheless. This week(*), Humble Bundle offers a very special bundle dedicated to board gamers: the Humble Weekly Bundle: Tabletops. If you’re not already familiar with the hugely popular Humble Bundles, it’s simple: you decide what you pay to get a big bundle of great indie games.